The Keil PK51 Professional Developers Kit includes several example programs that are configured for the Keil MCBXC866 Board. Each example program is stored in a separate folder along with project files that help you quickly build the project and run the program. Each example program is configured for two targets: Simulation and Target via ULINK that allows software testing in the target hardware using the Keil ULINK USB-JTAG Adapter to connect to the On-Chip Debugging System (OCDS) of the XC800 Device. The OCDS interface of the XC866 device enables memory access, real-time execution with up to four breakpoints, and program single stepping. However, OCDS does not provide timing analysis capabilities for your application program. Exact execution timing is obtained using the accurate device simulation provided by the Keil µVision Debugger. The µVision Debugger/Simulation provides complete and accurate device simulation for the XC866 device. For example, you may use the Logic Analyzer or the Performance Analyzer to get the execution timing of your application. 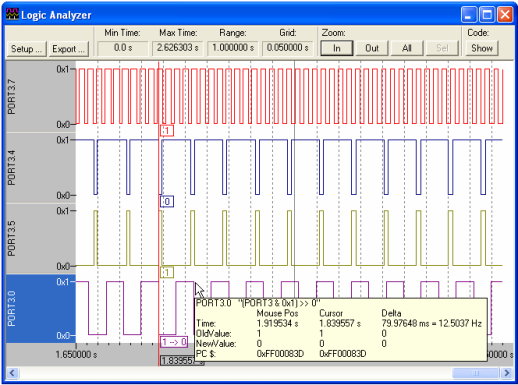 The Logic Analyzer provides a graphical display for value changes of variables or VTREGs that you specify. The Performance Analyzer displays the execution time recorded for functions and address ranges you specify.